We are looking for feedback from parents on the new NYS Education Department Parent Dashboard. 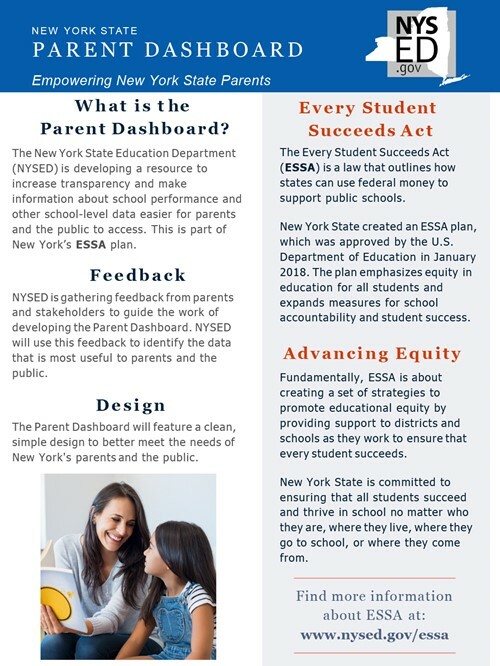 What IS the NYSED Parent Dashboard, you ask? The New York State Education Department is developing a Parent Dashboard to increase transparency and make information about school performance and other school-level data easier for parents and the public to find. This is part of New York’s ESSA (Every Student Succeeds Act) plan. Before the Education Department creates the Dashboard for you to use, they want you to tell them how they can make the Dashboard as useful as possible. Informational resources in English and Spanish are found below. If you have any questions or would like more information, please contact ParentDashboard@nysed.gov.